$211.18 - Baxton Studio Jennifer Lounge Chair-109-690 Jennifer Modern Lounge Chair with Gravel Fabric Seat - 32 x 27.63 x 20.63 in. Home Furniture>Living Room>Recliners & Loungers Baxton Studio Jennifer Lounge Chair-109-690 Jennifer Modern Lounge Chair with Gravel Fabric Seat - 32 x 27.63 x 20.63 in. 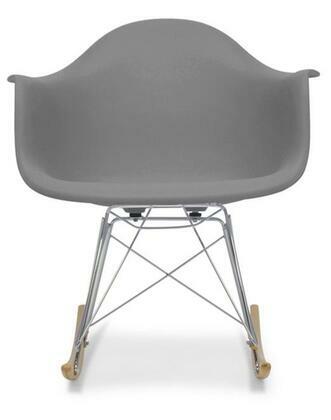 Baxton Studio Jennifer Lounge Chair-109-690 Jennifer Modern Lounge Chair with Gravel Fabric Seat - 32 x 27.63 x 20.63 in. Evoking a combination of nature-inspired transitional and Danish modern furniture style our Jennifer Lounge Chair makes the perfect accompaniment to your living room seating area. 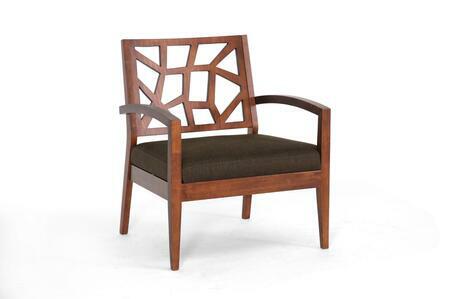 As far as living room accent Chairs go the Jennifer Chair is built to last: a solid Malaysian Oak wood frame with walnut-style veneer finish make this the perfect choice. Polyurethane foam cushioning topped with twill fabric upholstery in gravel multi colors makes this your favorite place to sit and an extra-wide seat provides additional comfort. To clean wipe with a damp cloth/spot clean. Made in Malaysia assembly required. The Baxton Studio Jennifer lounge chair features a solid wood frame with polyurethane foam cushioning and an extra wide seat. 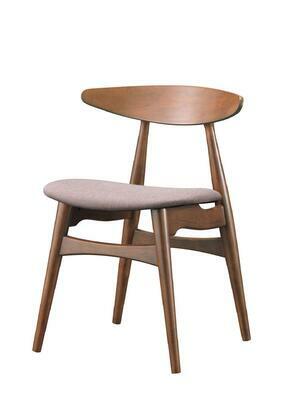 This Danish modern furniture style evokes a nature inspired silhouette. Wipe with a damp cloth or spot clean. Materials: Polyurethane coated lwather and hardwood. Dimensions: 32H x 28W x 25D. Limited Manufacturer's Warranty. This item requires oversize delivery. Please refer to the Order Summary in the Shipping step at checkout for delivery charge. 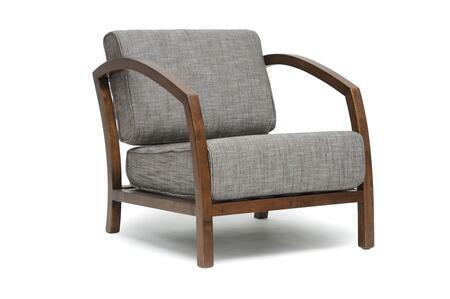 This Baxton Studio Venza lounge chair has a casual and relaxing design. This mid-century modern inspired armchair is built with clean paneled lines on the back, bringing relaxing vibes into your living room and complementing your home with lavish style. The cushions are upholstered in soft but resilient light brown polyester fabric for plush comfort and lasting good looks. 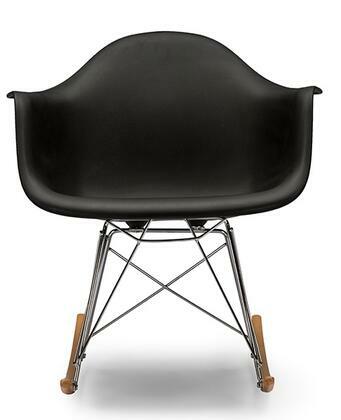 It features splayed legs with sloping arms for a mix of minimalist and contemporary styling in your space. Spot clean only. Made from 100% Polyester and Rubber Wood. Dimensions: 29.5H x 28W x 33.1D. Limited Manufacturer's Warranty. This item requires oversize delivery. Please refer to the Order Summary in the Shipping step at checkout for delivery charge. 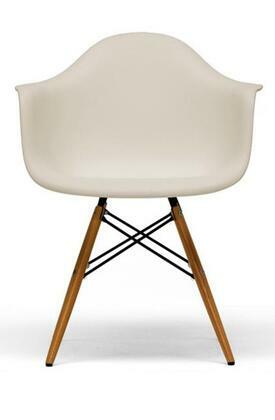 This Baxton Studio Hadley lounge chair will evolve your space with its retro-inspired stitching. It features curvaceous armrests with splayed legs for a retro modern touch and is a fully upholstered accent chair with exposed dark walnut wood that looks great from all angles. There is light beige polyester fabric upholstery for a soft to the touch seat that is also resilient and it is foam padded for plush comfort. This chair showcases ribbed stitch design for a touch of retro style and the cushioned seat is trimmed with silver nail heads for a glamourous look. Made with 100% Polyester, MDF, Rubber Wood and Foam. Spot clean only. Dimensions: 35H x 25.8W x 29D. Limited Manufacturer's Warranty. This item requires oversize delivery. Please refer to the Order Summary in the Shipping step at checkout for delivery charge. The Baxton Studio Caelie Lounge Chair features a scroll back design, plentiful button tufting on the seat, and detailed front legs with silver tone metal nail head trim. 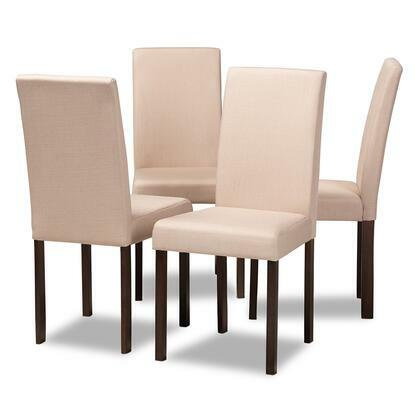 The Birch frame and high density polyurethane foam cushioning make this a chair that will stand the test of time. Spot clean only. Materials: Linen, Birch wood and foam. Dimensions: 31.25H x 25W x 31.5D. Limited Manufacturer's Warranty. 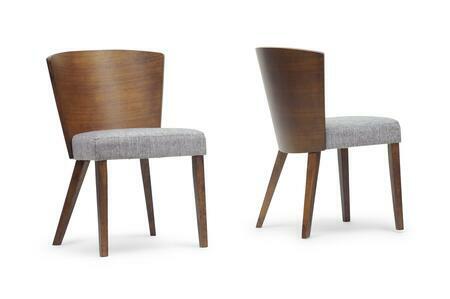 This Baxton Studio Rondel lounge chair embraces modern design with mid-century sensibility. 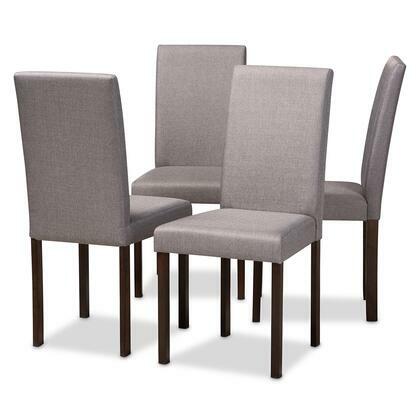 It features an exposed, slatted solid walnut frame that is complimented by a comfortable cushioned seat and completely upholstered in grey polyester fabric. To add more comfort, there is a removable back rest pillow that is added for lumbar support. It is imparted with a timeless appeal that is persistently fresh and a welcome addition to a variety of living spaces, especially for any minimalist living room setting or Scandinavian-like setting. Spot clean only. Made from 100% Polyester, Rubber Wood and Foam. Dimensions: 34.3H x 25W x 30.5D. Limited Manufacturer's Warranty. This item requires oversize delivery. Please refer to the Order Summary in the Shipping step at checkout for delivery charge. The Baxton Studio Canberra lounge chair features a contemporary design with edge piping, button tufting, a swivel base and upholstered with a contemporary touch. Spot clean only. Materials: Fabric, wood and foam. Dimensions: 29.64H x 30.81W x 30.42D. Limited Manufacturer's Warranty. This item requires oversize delivery. Please refer to the Order Summary in the Shipping step at checkout for delivery charge. This Baxton Studio Casanova lounge chair has a modern and contemporary inspired design that evokes a sense of sophistication. It is constructed of sturdy hardwood and plywood, and resting on solid walnut-finished eucalyptus legs that are sure to be a lasting piece in your collection. This chair is foam padded for comfort, and features a reclining back, raising footrest, hidden steel push-back mechanism, and arms placed at a height to promote relaxation and lounging. Made with 100% Dacron, Eucalyptus Wood, HDF and Foam. Spot clean only. Dimensions: 39.37H x 28W x 33.07D. Limited Manufacturer's Warranty. This item requires oversize delivery. Please refer to the Order Summary in the Shipping step at checkout for delivery charge. This Baxton Studio Carina lounge chair proves that a design can be simple and fun at the same time. The mid-century modern inspired design is updated with fabric upholstery that is generously foam padded for hours of comfort. The chair back features an attractive grid tufting detail with a casual yet cool low-profile that sits on tapered espresso brown legs. Limited Manufacturer's Warranty. This item requires oversize delivery. Please refer to the Order Summary in the Shipping step at checkout for delivery charge. 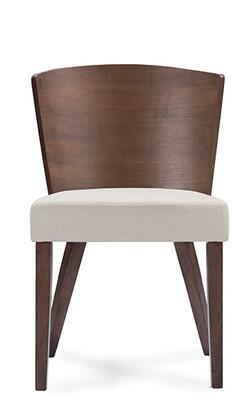 The Wyatt Dining Chair is a timeless design reminiscent of the traditional English dining room. Crafted from solid rubberwood frame to ensure perfect construction for years to come this classic chair comes with grey polyester fabric seat which will lighten up any living space. Long dainty legs combined with a classy spindle back create clean lines and a classic shape that make this chair at home in almost any decor. Minimalistic and beautiful this chair can fit comfortably into Scandinavian style homes whilst paying tribute to traditional style. Made in Malaysia the Waytt dining chair requires assembly.